Some people get a kick out of hearing themselves talk or making sounds. Others get a kick out hearing you talk or make sounds. Now you can play a great game of Yackety Smack and do both! Players record their own voices and sounds as a way to personalize the game and also make it that much more unique to the players you are playing with. 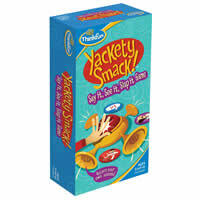 Yackety Smack is a type of speed game where you'll need to recognize the sound or voice, match it with the cards that are being rotated over and once a match is made, you'll race to smack the Yackety Smack recorder in the center of the table. There will sure to be some smacked hands during the process. Give this fun party game a try and see how creative you can be with recording your own sounds and voices. You'll get 1 sound smacker, 60 cards and the Yackety Smack game rules and instructions inside your box. Please keep in mind that the official Yackety Smack party rules and instructions could be different depending on the game version you have. The rules below are some of the exact directions on how to play Yackety Smack. Share with us your comments, funny stories, tips, advice, strategies, creative ways to play, questions about how to play, problems with the rules or anything you want about Yackety Smack. All submissions will be reviewed within 24 hours. Click here to add your Yackety Smack comments. Glad you had the rules. Mine are lost. Now that I've printed them they will stay safe in the box.